Corebridge Meta-directory Contains customer contacts information synchronized from any line of business applications including CRM, ERP, LDAP, SQL databases, directories and flat files. 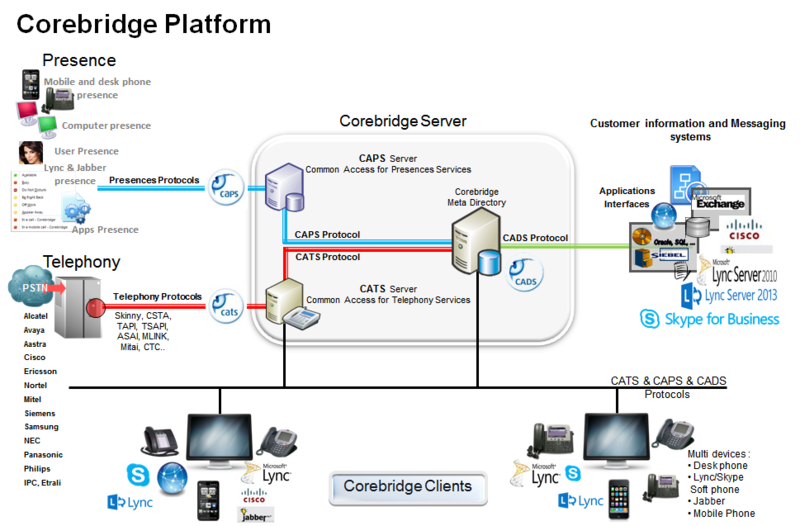 Corebridge Meta Directory allows call identification and application integration with 3rd party application. It provides a quick access to caller profile and efficient way to search contacts from different databases. The Meta directory acts as a “cache memory” of all types of contacts in only one single view. CAPS server (Common Access for Presence Services) - CAPS acts as a gateway for the delivery of applications presence, computers presence, users' presence, telephony "presence", Instant messaging presences and any 3rd party presence. Corebridge client applications Corebridge client applications enable user to access many different powerful features such as call control, search, call log, display caller profile, team supervision, video, Chat and call center functions.Corebridge client applications run on all Microsoft Windows desktop versions in addition to Microsoft Terminal Services and Citrix.